Sybil Lockhart, a Berkeley neurobiologist, became a “mother in the middle” when she was pregnant with her second daughter and her mother was diagnosed with Alzheimer’s disease. What makes Sybil’s story different, and so powerful, is that she understood the neurological processes, by turns exciting and devastating, that were taking place in the brains of those she loved. Interweaving her scientific expertise with her own complicated emotions, she writes with elegant simplicity and breathtaking honesty about biology’s inevitable, powerful effects on the people around her. When her mother begins to show the first subtle signs of the disease that is slowly ravaging her brain, Sybil refuses to consider the possibility of dementia, insisting that all her mother needs is a daughter nearby. She relocates her young family to her beloved San Francisco Bay Area, where her memories of her mother and her childhood are deeply anchored. As Sybil sets about creating new memories against the backdrop of her past, the emerging undeniable truth about her mother’s condition threatens to overwhelm her ability to maintain her career, nurture her marriage, raise her young daughter, and care for herself during her second pregnancy. Even though she appreciates the beauty of the dramatic biological processes at work inside the brains of her family members, she also understands their inevitable power, and she bravely describes the complicated emotions — denial, rage, ambivalence, exhaustion — that so many caregivers experience. 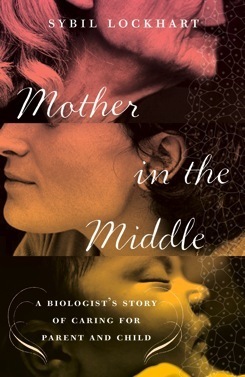 With a unique combination of science and intimate experience, Mother in the Middle is a story of mothers and daughters, science and creativity, and life’s exquisite intertwining of love and loss.